This is the first sign that stood on the corner of Grant and Wabash. It was put there by Byron Trippet in the 1930’s. The back story is that the Indianapolis alums were complaining that the campus corner was shabby and not particularly welcoming. Trippet was given the task of “dressing it up” and this sign was his answer. I love this sign as it tells who we are, what we do and how long we have been doing it. It is very simple and entirely straightforward. In the late 1950’s this sign was replaced with the more familiar wooden sign, which was later replaced with another, more substantial, wooden sign. We now have a different sign on the corner and, while the reaction to it has been mixed, to me the new sign is really rather similar to the first sign. Since Wabash was founded, things have been changing, like the campus location, the buildings and their uses and, of course, the curriculum. 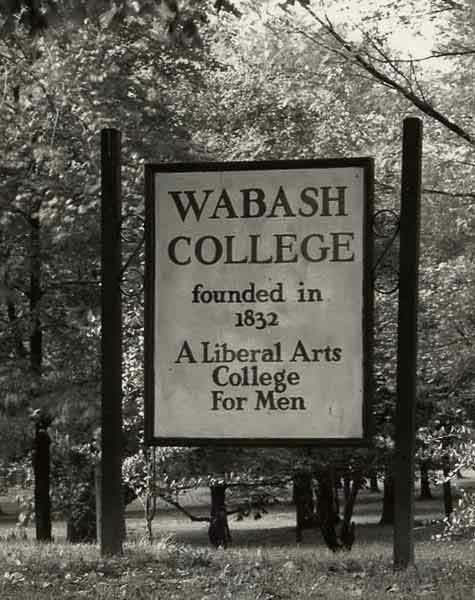 In fact, I would say that the only thing that really stays the same at Old Wabash is that we are, as we always have been, a Liberal Arts College for Men…I guess the sign says it all.